Late last year, Sammy McKay woke up with severe pain in her right eye. The 65-year-old Buena Vista resident had been blind for more than 10 years from what she believed was age-related macular degeneration, a leading cause of permanent vision impairment among the aging. But when she sought care for the pain, McKay learned her decade of darkness was needless. 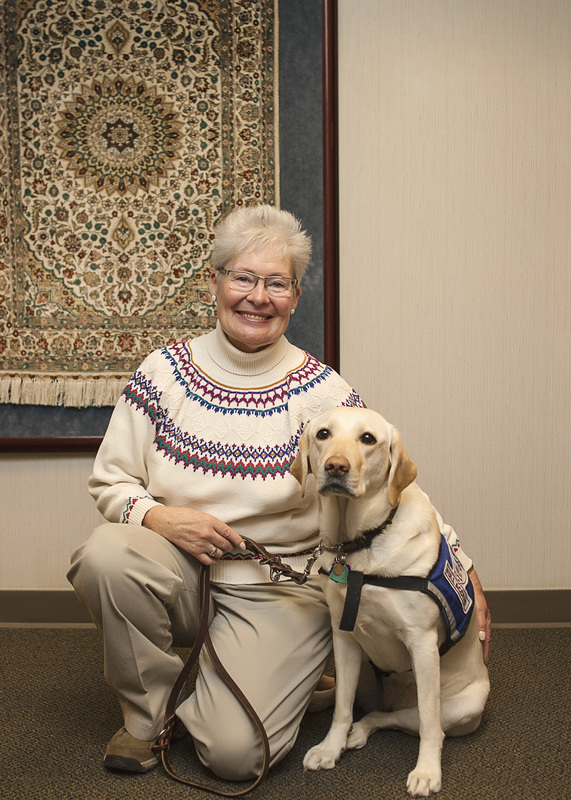 McKay no longer requires the aid of her guide dog, Kelney after cataract surgery restored her vision to 20/15. common clouding of the eye’s lens known as a cataract. McKay’s cataracts were as dense as those normally found only in Third World patients, Brock told her, but they were treatable. Brock performed surgery on McKay’s right eye and six weeks later, she did the left. Almost immediately McKay could make out people and objects for the first time in 10 years. 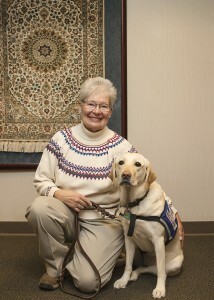 Today, she enjoys 20/15 vision and has retired her beloved guide dog, Kelney. “Since I have sight, it’s against the law for me to have her in harness,” McKay says. Brock emphasizes that McKay’s case is extreme — both for the severity of her cataracts, and the misdiagnosis that needlessly kept her in a world of darkness. But the incidence of potentially debilitating eye diseases multiplies with age, with glaucoma joining cataracts and macular degeneration as leading causes of vision problems now faced by baby boomers, Brock says. As with McKay, however, properly diagnosing the problem can go a long way toward mitigating it. “The most important thing you can do is schedule regular eye exams,” Brock says. “Once you’re over 50, you should have one every one to two years.” And if you’re experiencing pain or vision problems — especially if you have any family history — make an appointment right away. Here’s a guide to the most common eye problems associated with aging. WHAT IT IS: A clouding of the eye’s lens that causes blurry vision, faded colors, glare and reduced night vision. It can occur at any time but becomes more common with age. It is estimated that nearly one in five Americans over 40 gets them in one or both eyes. WHAT YOU CAN DO: The exact cause is uncertain, so there is no proven method of prevention. But outpatient surgery is common and effective, with resultant replacement of the cloudy natural lens by an artificial one — known as an intraocular lens or IOL — resulting in some 90 percent of patients enjoying vision improvement. WHAT IT IS: Damage to the optic nerve that occurs when normal fluid pressure rises inside the eye. Risk factors include age, high blood pressure, family history, African or Latin descent, and past eye injuries. Damage often begins as a blind spot but because glaucoma is painless it can go undetected until nerve damage is severe. WHAT YOU CAN DO: There is no cure, and damage can’t be reversed, but early detection can lessen the impacts. When pressure has built, it can often be lowered with eye drops, although in some cases surgery is required. WHAT IT IS: A disorder of the macula, the part of the retina that helps the eye discern fine details. There are two forms, wet and dry, which damage sharp and central vision and constrain common tasks like reading and driving. Risk factors include aging, smoking and family history. WHAT YOU CAN DO: Signs of the slowly developing and more common dry form are tiny yellow or white deposits under the retina. For patients developing wet AMD, straight lines might appear wavy. While there is no cure, vision loss can be combated with vitamins (C, E, beta-carotene, zinc and copper), luteins, and leafy green vegetables. Laser therapy and surgery are also being studied. Additional problems that become more common with aging include presbyopia, which lessens your ability to see close objects or small print clearly; dry eyes that develop when your tear glands can’t produce enough tears or produce tears of poor quality; floaters, the tiny spots or specks that float across your field of vision; and diabetic retinopathy, a complication of diabetes that damages the retina’s blood vessels. Effects can range from minor annoyance to blindness, and like other vision problems are detected and tackled best through regular eye exams.